The Indian Army forms the backbone of our nation. It is the ever-dependable body that stands shoulder-to-shoulder, ready to save lives at times of distress including terrorism, insurgency and natural disasters. They are the ones who are protecting us today. However, their devotion often comes at a cost. Several brave army-men are severely injured in the line of duty every year but continue to contribute to society, bringing the qualities of discipline, honesty and integrity with them. Commemorating the 70th year of Independence, Paytm is saluting this spirit of valor and fortitude of the Indian Army, by inviting contributions to Indian soldiers disabled in the line of duty. 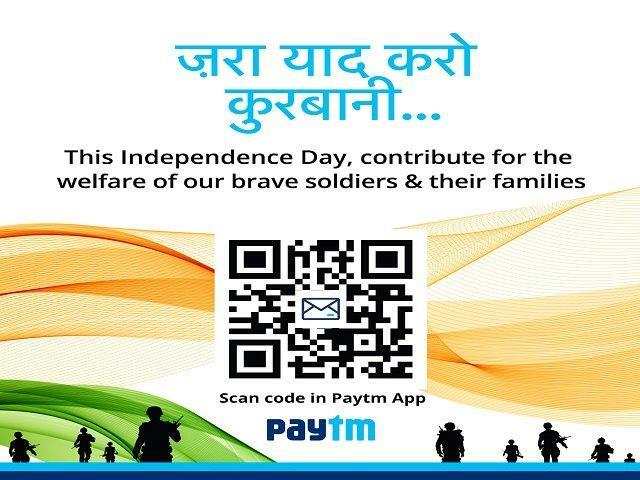 Customers can scan the QR code from Paytm’s Independence Day special advertisement or banners published across all major national and regional dailies as well as social media to contribute for the welfare of our soldiers. The company will also contribute its earning on Independence Day to these brave army-men and their families.